Soquel’s Poetic Cellars and Campbell’s Psycho Donuts team up on pairing. “That just changed my life,” exclaimed Chanelle Takemoto after the first wine and donut pairing—a fruity, clean and fresh 2008 Chardonnay from Poetic Cellars coupled with a Monte Cristo donut from Psycho Donuts filled with ham, Swiss cheese and raspberry jelly and topped with powdered sugar. 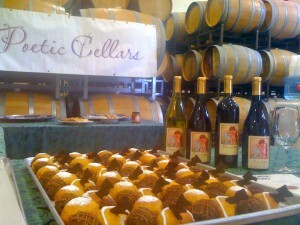 The pairing was the first in a flight of four called The Poetic Psycho, four smaller-bite, pull-apart donuts created especially to pair with four Poetic Cellars wines. “They’re actually phenomenally good, really creative and beautifully put together,” said Linda Wang of Sunnyvale, who was at her second Poetic Cellars-Psycho Donuts pairing event. The event, which took place at Poetic Cellars’ tasting room in Soquel on Saturday, brought together the unique flavors of wine and unusual treats from Campbell’s Psycho Donuts. The 2007 Serenade, Lovell’s personal favorite and 2011 San Francisco Chronicle Wine Competition winner, was paired with a triangular, cherry-filled donut with a solid dark-chocolate lightning bolt adornment, another of the four in the pull-apart Poetic Psycho tasting. “The Serenade was paired really well,” wine expert Austin Twohig said. A television production crew was also at the event following Psycho Donuts for a possible upcoming reality TV show on donut and wine pairing. Psycho Donuts, which opened in 2009, is known for its off-beat donuts and attitude. The shop is set up like an asylum, the staff dresses like doctors and nurses and customers order from a list of donuts that includes names like Mood Swing, Headbanger and Jekyll and Hyde. “It’s themed like a light-hearted asylum. We’re donut doctors,” Psycho Donuts owner Jordan Zweigoron said. Zweigoron added that his customers are usually pleasantly surprised by his offerings. The Kooky Monster (vanilla icing and Oreo cookies) and the Passionata (white chocolate and fresh passion fruit with raspberry icing) are among the favorites at the shop, which also offers guests bubble wrap to pop and a padded cell in which to take photos. 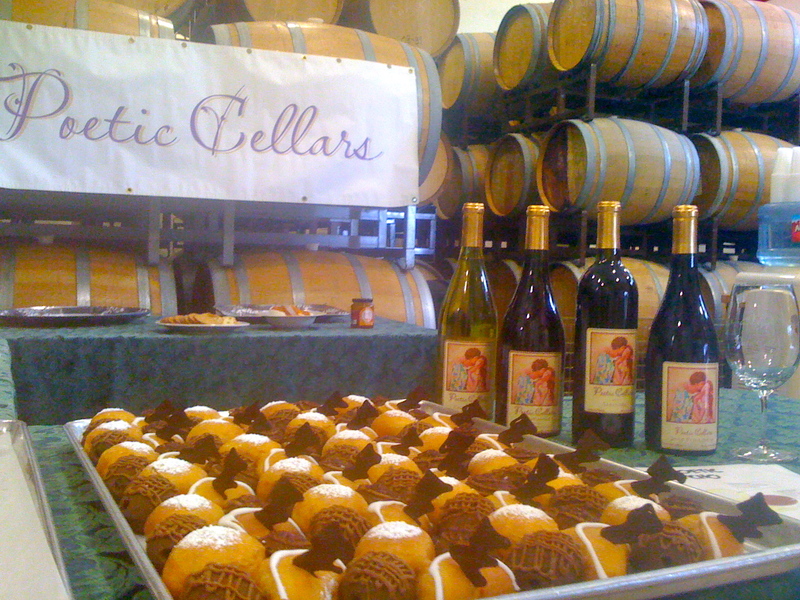 Pairing their wines with different flavors is nothing new to Poetic Cellars, which also regularly offers Jelly Belly candies and apricot chili preserves with the wines in its tasting room. About 30 people attended the event, but don’t worry if you missed out, they’re expected to team up again. For more information on Poetic Cellars, click HERE. For more information on Psycho Donuts, click HERE. Article published on Patch.com on April 24, 2011.